NOTE: You need to have a copy of WordPress 3.9+ installed onto your server in order to install the theme. You can install custom themes or plugins on the accounts hosted at WordPress.com Business Plan only. 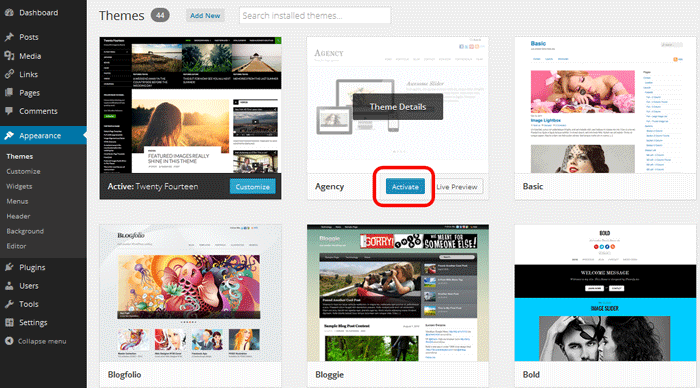 You can install WordPress themes using: WordPress theme uploader or FTP. Note: some browsers (e.g. Safari) automatically extract zip files. Right click on the download link and select "Save Linked File As", which will allow you to download it as a zip file. Some browsers (e.g. Safari) auto extract the .zip file. Try to right-click on the download link and select "download file as". If you are using Safari, you can also disable the auto open feature by going to Safari > Preference and uncheck Open safe files after downloading. Make sure you upload the theme.zip file, not theme-psd.zip file. The theme-psd.zip is the Photoshop mockup file. This might be due to conflicts between plugins or WordPress. Follow this tutorial to fix it.